For the scenic pleasure, the automotive delight or the escape from mundane life, five of our clients give us their personal account on their most favourite drives. The reasons for the drive tend to be as vast as the cars they select and the locations they set out to explore. Yet what they do have in common, is that a luxury car that chases the breeze on Europe’s most picturesque mountain passes never ceases to capture their avid fascination. For my road trip through the Susten Pass I chose to hire the Mercedes SLS Roadster which I think proved itself to be an excellent decision. Asides from being an exquisitely designed car, it drove like a hockey puck on ice and was as smooth as anything. Before I left I had spent weeks working on a huge investment for a client and by the time I finished I knew I was in desperate need of a vacation. So, I took a few weeks off to take on the Susten Pass, a drive that I have wanted to do for a long time. The Susten Pass delivered entirely, giving me every sense of freedom that I was after. A high mountain pass located in the Swiss Alps, it connects Innertkirchen in the state of Bern with Wassen in the state of Uri. Incredibly atmospheric, at 7,296 feet (2,224 meters) altitude, there is a 984 feet (300 meter) long tunnel that cuts through the rock of the mountain. Perhaps the only downside was that I was hoping to be able to claim the road to myself, but on the contrary, this remote section of mountain highway is really popular with both locals and visitors from all over the world. It is all too easy to understand the popularity, because on the south side there are spectacular views of the Stein Glacier, not to mention the awesome switchback turns and the excellent quality of the winding roads. It was all legendary! I think since we were both kids, we’ve always dreamed of trailing along one of Europe’s most impressive mountain passes and I think the Silvretta High Alpine Road really fit the bill. Known in the German as the Silvretta-Hochalpenstraße, it is widely regarded as one of the most beautiful panoramic roads in the Alps, and from our experience it really lived up to form. The mountain pass runs for about 22 kilometers, where we started it in Partenen in the Montafon and it extends all the way to Galtür in the Paznauntal of Tyrol. For the occasion we also hired the ultimate car of our boyhood dreams, the Porsche 911 Targa 4 GTS, which we both took turns driving. On the plus side it was good to share the expense and take turns just enjoying the scenery, on the down side when it came to tackling the exciting bends in the winding road at 2,000 meters high, it did necessitate some degree of what I would consider “passionate negotiation”. Overall, I think we would both agree that it was a great experience. Apparently, the stretch is locally known as the “Dream road of the Alps for connoisseurs” and it proved to be a great place to test the limits of our 911 Targa. 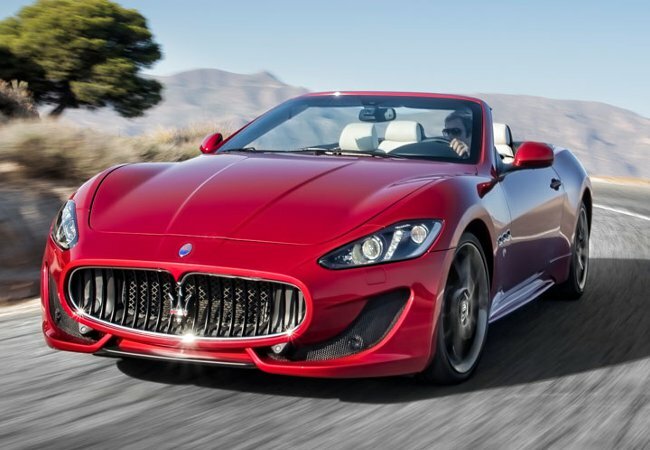 Because hopefully a honeymoon doesn’t come around too often, we decided to go all out and hire the Maserati GranCabrio Sport for a scenic tour across Tuscany. Driving across Italy’s Strada Statale was nothing short of sensational and incredibly beautiful. I can tell you there is a good a reason why Tuscany’s scenery is so famous! The road wound its way through many small towns, villages, wineries and olive groves, all providing these amazing breath taking views of the Tuscan countryside. 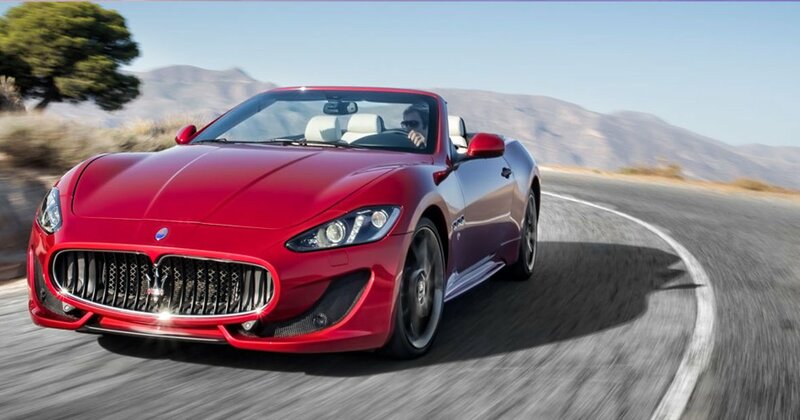 The Maserati drove beautifully and with the hood down, it offered every sense of freedom. We stopped off at numerous wineries along the way, so we had to work out between the two of us who was going to stay sober, I have to acknowledge that Liam was quite the gentleman in this case. We did an overnight stay in a medieval castle in Siena and took a cooking course to learn the arts of Tuscan cuisine. I can’t honestly think of a better way to spend a romantic honeymoon. In French we say “Vivre le moment” and that roughly translates to “There is no better time like the present”. So for that reason I decided it was about time I took the famous Grimsel Pass through Switzerland. Besides all that, I decided I ought to visit my daughter who had moved to Switzerland and had just had a baby earlier on in the year, turning me into a grandfather. My selected weapon to tackle the Grimsel Pass was the magnificent Ferrari California, that pierced the breeze with terrific force as it ascended the steep gradients of the mountain. The mountain pass which weaves its way in and and out of the mountain sides of the Swiss Alps ascends through canyons of wild beauty. The scenic terrain is marked by white granite rock and green foliage which is all beautifully reflected in the reservoir lake beds down below in the valley. Certainly a trip that I would like to do again one day, but maybe next time with my granddaughter? This journey was a long time overdue for us, we had planned it ages ago, but with work commitments and just life getting in the way we kept pushing it off. Eventually, because we also have plans to adopt a baby from Indonesia later this year, we decided to prioritise having this trip together before we launch ourselves into life’s next big journey. Our plan was to hire the Audi R8 Spyder for our scenic road trip across the Feldberg Pass in Germany. Located in the famously beautiful Black Forest of Bavaria, it was the perfect location to match the elegantly designed and styled Audi R8 Spyder. Together they proved to be a perfect synchrony of beauty and power. The scenic pass is part of the B 317 Federal highway which connects Todtnau in the Wiesental valley with Titisee-Neustadt. The south western end is probably more exciting as it is characterised by hairpin bends and can get exceptionally steep, climbing 483 meters over about 7 kilometers. We took a walk through the Feldberg nature reserve, a beautiful area that has been hemmed-up to the tourism industry as new restaurants and hotels are to be found all over the place. I remember this wasn’t the case 20 years ago! Still, not shy of enjoying life’s creature comforts we shared a cheese fondue as we looked out over the beautiful natural scenery. It was really a great way to take a sweet pause out of our otherwise slightly hectic lives.